Here is Spiegel's Debbie-Polly. She had an unusual name to be sure. She was 11.5 inches. There were several versions of this doll, several cases, and she came with a variety of clothes. Some Polly dolls grew hair, some had a cap on top of her head that swiveled, making it blonde or brunette. Very unique indeed! Debbie-Polly's paperwork inside her case. This lovely doll is made by the French company Clodrey. While more a "dresser doll" than a play doll, she is here because she has a body, arms and legs made from Crissy's molds, just like Palitoy's Sheena above. Her shoes are molded from Crissy's shoe molds as well. She did not grow hair like Crissy. 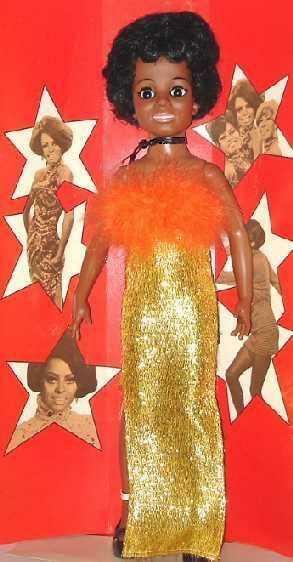 While we are on the subject of dolls that weren't hair-play dolls, but they were created with Crissy molds, I thought I would share Ideal's Diana Ross doll. Her torso, arms and legs are, without a doubt, created with with Crissy molds. Here is the back detail on Diana's gown eye-lash lame' gown. It was even made with the same pattern as the Sears exclusive "marabou gown" for Crissy! Diana's undies were white. Above and below: MIB Diana Ross photos courtesy Sebastiani. Diana's shoes were molded with the same shoe molds as Crissy's shoes. Sometimes they were molded in gold-toned vinyl but these are actually yellow shoes underneath gold paint, inside and out. As you can tell, the gold is wearing off with time. The French company Bella, created an entire line of dolls that grew hair during the better part of the 70's. They created Tressy, Cathie, Betsie, Leslie, and many more! Most were hair-play dolls. They were all stunningly beautiful. Their legs were jointed and covered with a soft foam. Over that, she had loose knit tights permanently attached to her legs. She was very posable and could be modeled to sit in many different ways. Cathie, et al, also had a lovely bedroom set and an absolutely COOL coiffure station. All of their outfits were styled after the best of French couture. Here are 1977 and 1978 Cathie de Bella dolls. Oops, one of the Cathie dolls is missing her shoe! Cathie had such a lovely face! This little gal is a total knock-off on American Character's Tressy doll! She looks very nearly identical to her in the face. Her name is Harriet and she was created by the Sunshine Doll Company. She is a very poor quality doll, but her eyes do open and close! These dolls entered the archive with just the tops of their boxes! The pullstring mechanism was somewhat rudimentary. The base of her growing hair was attached to a string and came out of her back. There was a knot in the string (near her back) that kept the little one from pulling the ponytail completely out of the top of her head. Horsman had an interesting doll with their Pert-n-Pretty doll. Here's the interesting part: Horsman set up shop in the same building in China that Ideal had years before. Apparently they got their hands on some of Crissy's original molds left behind at the old factory. They created a prototype of their Pert-n-Pretty doll using these exact molds. See below. The doll above is the 1988 doll. Here is the 1989 Pert-n-Pretty doll. Same doll, different outfit. Now this P-n-P prototype should look VERY familiar to you. Horsman even used the Crissy head mold they found! They used the same blue eyes that they used for the Pert-n-Pretty dolls. Curiously, they molded the prototype in the same light skin tone that the real P-n-P dolls were eventually molded in. Check out the sticker found on the bottom of her shoes (which incidentally are shiny black Crissy shoes with Ideal scratched off of the mold). The number on the sticker is the actual stock number found on the 1988 doll. Horsman also scratched Ideal off of the body mold when they used it. How do I know this is a prototype of the Pert-n-Pretty doll? I had the opportunity to talk to the person that actually designed the outfits for the P-n-P dolls, though since I bought the doll through eBay, I'm sure she had no idea she was talking to me. We carried on our dialogue through eBay's email system prior to the sale. She had two prototypes all these years and sold them. I was lucky enough to get one of them into the archive. They were created for her to use as models. All of this leads us to wonder why exactly would Horsman use the body and not the head mold from Crissy for their new doll. Probably because Ideal was still around in the late 80's though owned by another company. Surely, using one of the most recognizable doll faces in history for a new doll with a new name would bring them dangerously close to getting sued for copyright infringement. The designers opted to create a new head instead. Still, they were pretty daring to use the shoes, body, arms and legs that belonged to Ideal. For further edification on this prototype, you may click here to read this article.